『석보상절』은 세종 28년(1446)에 소헌왕후가 죽자 그의 명복을 빌기 위해 세종의 명으로 수양대군(후의 세조)이 김수온 등의 도움을 받아 석가의 가족과 그의 일대기를 기록하고 이를 한글로 번역한 책이다. 석보상절 권11(釋譜詳節 卷十一)은 전기활자본의 복각본(한 번 새긴 책판을 그대로 본떠 다시 목판에 새겨 발행한 본)이다. 복각한 사실에 대해서는 연산군 1년(1495)에 성종의 명복을 빌기 위해 내탕금(內帑金:임금이 사사로이 쓰는 돈)으로 여러 가지 불교서적을 간행했는데, 그 중 『석보상절』 20부가 수록되어 있음이『선종영가집』과『반야심경언해』에 붙은 학조의 발문에 나타나므로 이 책이 혹 연산군 1년에 만들어진 판이 아닌가 짐작되기도 한다. 그러나 이 책은 글자새김이 거칠고 또 난외(활자판 바깥부분)에 시주자들의 이름이 많이 새겨져 있는 점과, 종이의 질 등으로 미루어보아 연산조판으로 단정하기에는 너무 문제점이 많고, 이것은 후대에 어느 사찰에서 복각한 것인 듯 싶다. 1959년 대구어문학회에서 영인본으로 간행하였다. King Sejong ordered Prince Suyang (King Sejo later) to write about the Buddha’s family and life to pay tribute to Queen Soheon after she died in 1446 (the 28th year of the reign of King Sejong). Aided by Kim Su-on, the prince completed this historical document, which was translated into Korean, to be called the Episodes from the Life of Sakyamuni Buddha. Volume 11 is a reprint of the previous printed book; the previous edition was copied on woodblocks to be published again. In 1495 (the first year of the reign of King Yeonsangun), King Yeonsangun published various Buddhist books using his own money to pay tribute to King Seonjong who had passed away. The postscripts of monk Hakdo, which appear in Seonjong Yeonggajip (Essence of Seon Buddhism) and Banya simgyeong eonhae (Heart Sutra translated into Korean), say that 20 volumes of the Episodes of the Life of Sakyamuni Buddha are among these books. Thus, this volume may have been published during the first year of the reign of King Yeonsangun. 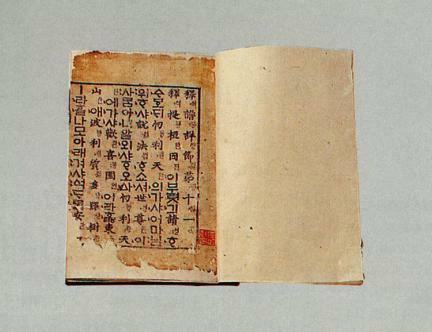 Considering the volume’s rough engraving, numerous donors’ names in the margin, and poor paper quality, however, it is difficult to conclude that it was published during the reign of King Yeonsangun. It is presumed to be printed at a temple later. Its photographic edition was published in 1959 by the Daegu Language and Literature Society.